Around this time in 2015 I did a post about What's in My School Makeup Bag. This year I thought it would be fun to do a post about all my favorite, most used school/office supplies. I'm not in school at the moment but I still use notebooks and other office supplies more than I ever used when I was in school. I really love going through the aisles of school supplies on sale this time of year. I go through so many notebooks and pens and pencil lead, these sales are the best! I love buying things on sale and in large quantities when I know I'm going to use it. Back to school sales are a dream! So now that those sales are in full swing I thought it would be great for me to make a Back to School Essentials. I always loved going BTS shopping. I love opening a fresh notebook or a new pack of mechanical pencils. I am addicted to post-it notes and post-it tabs and notebooks. No joke my family buy me notebooks with cool covers as Christmas presents. I'm not kidding. So on that note let's start with notebooks. I love the Five Star Notebooks! The ones with plastic covers are the best! And they come with so many cute covers nowadays! I also like to get any cute little notebooks I see. I go through smaller notebooks for my blog like crazy! Staying with Five Star they make adorable Pocket Folders! I really like the paper ones since they are stiffer than the plastic ones. They have awesome colors and they came out with prints this year! I am very organized when it comes to my notebooks. I use Post-it tabs more than I probably should. I love them. It kind of an addiction. I use them to organize my blog notebooks. I have so many in my pencil case. I really love them. It's kind of weird. I also use a ton of Post-it notes. I love to use the 3x3 ones to write notes to myself or draw on or use them to edit my book. I write my book in composition notebooks so editing large sections is almost impossible. So I write my edits on post-it note and stick them into the notebooks. I haven't used a real pencil in years. I don't think anyone has. I love the BIC Velocity 0.7mm pencils the best. They are shaped like pens and the grip on them is really nice. I use BIC or papermate 0.7 lead for them as I have found it is the toughest. The only thing I don't like about the Velocity pencils is that they only come with 6 erasers. When you use them up you have to buy a new pack. Since the erasers go fast on the Velocity pencils I like to use those big pink erasers. Especially if I'm doodling. I have used many brands and they all work great! Have you ever used a gel pen? They are so much better than regular pens. I don't even have any normal pens in my pencil case anymore. I love love to use the black gel pens way too much. I like the Casemate or Pilot gel pens the best. I also really love the colored gel pens that Pilot makes. I don't use highlighters that much anymore but I still have them in pencil case. I have always used the BIC Bitelite highlighters. They are thin and come in a 5 pack of yellow, blue, pink, green and orange. They are great for taking notes since you can do different colors for different classes. My go-to permanent marker is Sharpie. I'm pretty sure everyone uses them. Like when you talk about permanent markers you always say Sharpie. It's like how a lot of people say Kleenex instead of tissue. I like the Fine Point Sharpies the best. I mostly use them to write on my post-it tabs and my folders. I recently started sketching and drawing again and I have been using Crayola Colored Pencils all the time. I have had the 50 pack. I also use the the Crayola fine tip markers when I'm drawing. Since I create almost everything on my laptop I use flash drives non-stop. I use them to save blog photos and posts and my other photography too. I found the PNG flash drives on amazon for super cheap and I add one to every order. I use a different ones for everything! One for my blog, one for writings/short stories/novels. One for my photography, one for my graphic designs and one for art. I love the PNG ones because so far they have been very reliable and they come in different colors so it's easier to know which is which. I also have a WD Passport External Hard Drive that I put everything on as a backup to all of the stuff saved on my laptop. During a recent trip to Target I fell in love with the Ubrands brand. They make the cutest office supplies! The binder clips in the photo in this post are from Ubrands. I also really love their paper clips and push pins. They have round flat marble push pins! You also definitely need a planner. Either a July to July or a January to December. I prefer Jan-Dec now that I'm not in school. They make so many cute planners! 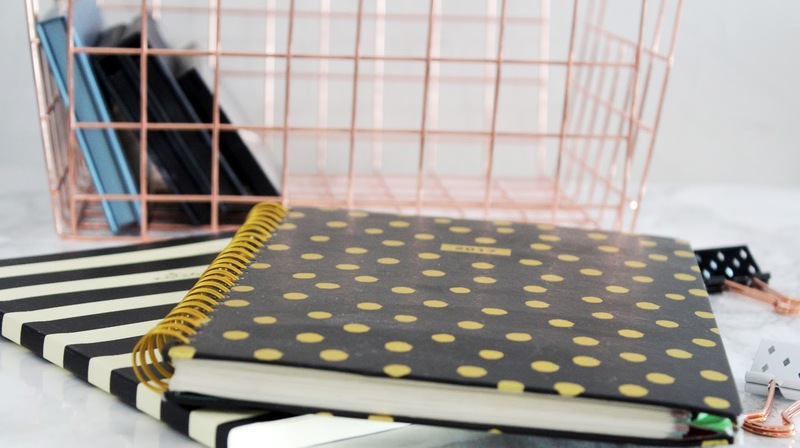 The black and gold book in the photo above is actually my current planner. I'm on the hunt of a new one. But the Jan-Dec usually don't come out until October or November. I also still use binders. I have one for recipes. I have one for blog stuff. And I'm about to start one as a photography portfolio. I like the simple plastic and cardboard ones. But I used to use one of those big ones with the zipper in school. What are your favorite back to school products?! Let me know in the comments below! Photo Credit: Photo Background from taken by me with a Canon T5 & a 18-55mm lens and edited in Photoshop by me.